MicroRNAs (miRNAs) are a family of single-stranded, endogenous, small noncoding RNA molecules of approximately 20 nucleotides  that act as key regulators of gene expression by binding to the 3′-untranslated regions (3′-UTR) of target mRNAs [7, 8, 9]. miRNAs can regulate gene expression by repressing translation or accelerating the degradation of mRNA . By modulating different target genes, miRNAs play vital roles in diverse biological processes, such as tumor angiogenesis, cell proliferation, differentiation, stress responses, apoptosis, adhesion, glucose uptake, metastasis and resistance to cancer chemotherapy [11, 12, 13, 14, 15]. miRNAs can downregulate multiple target genes, including oncogenes and tumor suppressors; thus, some miRNAs function as tumor suppressors, and others function as oncogenes . Accumulating evidence has shown that the dysregulation of miRNAs plays an important role in glioma progression. Recently, several studies have shown that miR-770 is clinically significant and plays a crucial role in carcinogenesis and cancer progression in a variety of cancers, such as breast cancer, non-small cell lung cancer, ovarian cancer and hepatocellular carcinoma [17, 18, 19]. Nevertheless, the role and molecular mechanism of miR-770 in human glioma development remain unknown and need to be further elucidated. In recent decades, emerging evidence has demonstrated that miRNAs are actively involved in the pathogenesis of cancers . Many miRNAs have been identified by microarray screening in gliomas [21, 22, 23]. In addition, miRNAs have been found to be key regulators of glioma cell proliferation, differentiation, apoptosis, metastasis, invasion and epithelial-mesenchymal transition [24, 25, 26, 27]. Due to the crucial roles of miRNAs in glioma, miRNAs have been proposed as prospective biomarkers and therapeutic targets of glioma . Although the clinical significance of miRNAs has been well characterized in glioma, the roles and the underlying molecular mechanisms of dysregulated miRNAs remain unknown. Therefore, identifying miRNAs and elucidating their biological functions in glioma will help identify novel targets for diagnosis and therapy. Recent papers reported the downregulation of miR-770 in non-small cell lung cancer and gastric cardia adenocarcinoma [18, 29]. It has been reported that miR-770 can suppress the chemo-resistance and metastasis of triple-negative breast cancer via direct targeting of STMN1 . 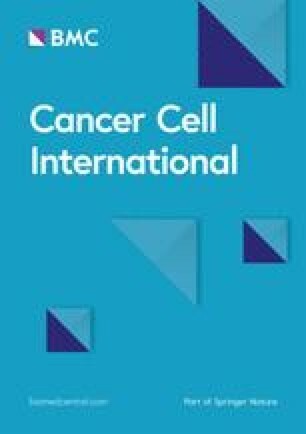 miR-770 functions as an anti-oncogene and promotes chemosensitivity in ovarian cancer by downregulating ERCC2 . 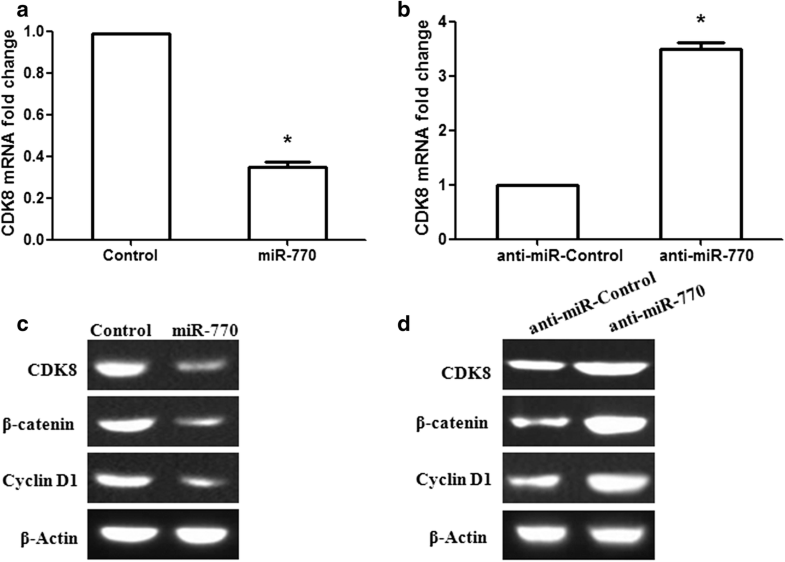 Moreover, miR-770 inhibited tumorigenesis and EMT by targeting JMJD6 and regulating the WNT/β-catenin pathway in non-small cell lung cancer . However, the exact functions and mechanisms of miR-770 during tumorigenesis in human glioma remain unclear. In the present study, we found that miR-770 expression was dramatically downregulated in both glioma tissues and cell lines. The clinicopathological significance of miR-770 expression was also analyzed. The results revealed that low miR-770 levels were significantly associated with WHO pathological grade, IDH1 status and KPS score in glioma patients. Interestingly, miR-770 expression decreased in IDH-mutated groups of glioma compared with IDH-wildtype, suggesting that miR-770 may play an importance role in glioma diagnosis. The experiment demonstrated that miR-770 remarkably inhibited glioma cell growth by inducing G1-S phase arrest and promoting cell apoptosis. Our findings suggest that miR-770 plays a key role in glioma development and progression. 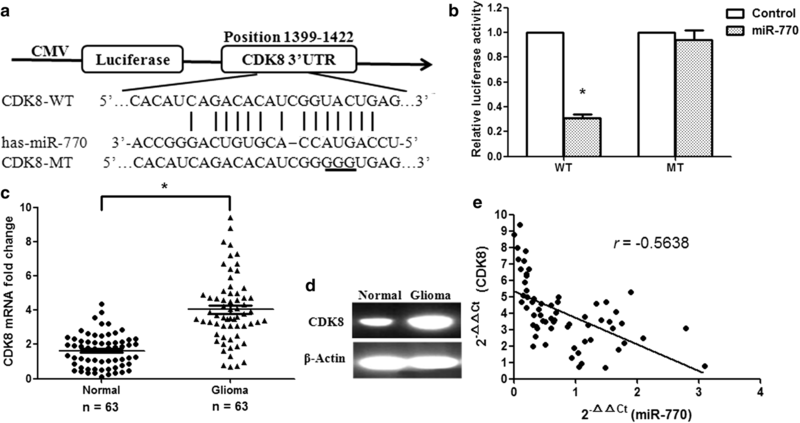 CDK8 is essential for β-catenin-dependent oncogenesis and progression in all kinds of cancers [39, 40, 41]. On the one hand, CDK8 can directly regulate β-catenin-activated transcription. For example, the β-catenin transcriptional program can be stimulated by a mediator complex, which includes CDK8, MED12, MED13 and its cyclin cofactor cyclin C [42, 43]. On the other hand, it has been demonstrated that CDK8 can directly phosphorylate E2F1 at S375 and then block the inhibitory effect of E2F1 on β-catenin transcription [44, 45]. The Wnt/β-catenin pathway is a conserved signaling pathway that is crucial for initiating and regulating a diverse range of biological processes, including embryogenesis, carcinogenesis, cell growth, apoptosis, and cell polarity [46, 47, 48]. For example, activation of the Wnt/β-catenin signaling pathway may facilitate the proliferation of embryonic, intestinal, skin, and neural stem cells, inducing the self-renewal and differentiation of stem-like cells [49, 50, 51]. The Wnt/β-catenin downstream regulator cyclin D1 is a crucial transcriptional factor in the G0/G1 phase . Cyclin D1-CDK4/6 protein kinase complexes can regulate the cellular progression from G0/G1 phase to S phase . It was reported that cyclin D1 is involved in human tumorigenesis. 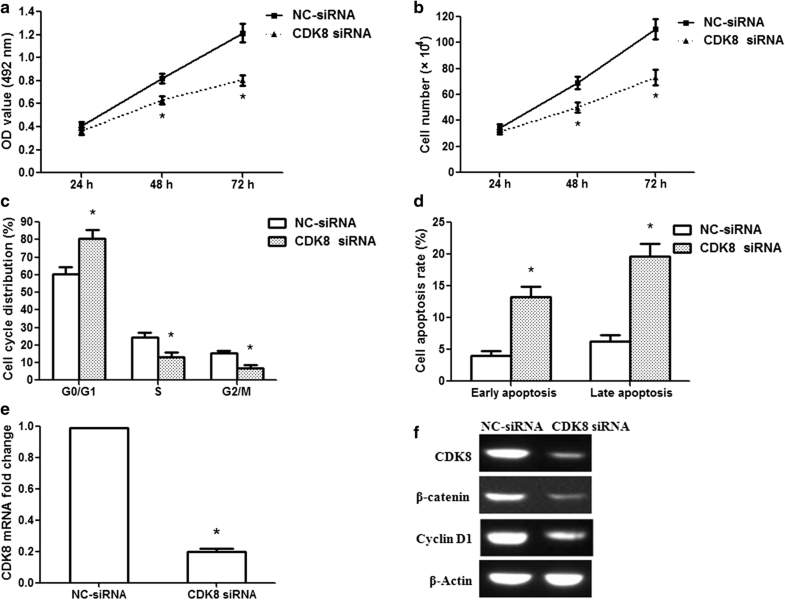 The results demonstrated that miR-770 overexpression and CDK8 siRNA could inhibit the expression of cyclin D1 and induce G1-S phase arrest by suppressing the Wnt/β-catenin signaling pathway. In contrast, anti-miR-770 increased the expression of cyclin D1 and drove more cells into the S and G2/M phases through activating the Wnt/β-catenin signaling pathway. 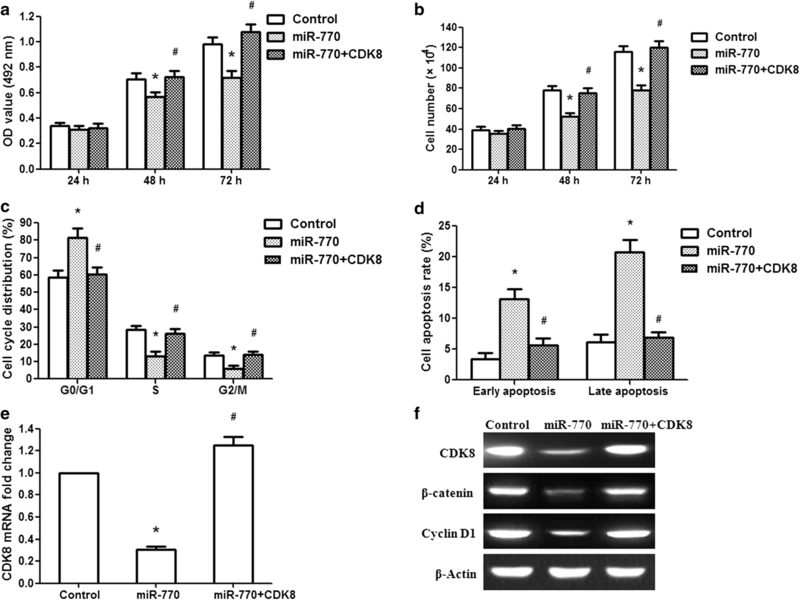 Furthermore, CDK8 overexpression eliminated the effects of miR-770 overexpression on glioma cells. Our findings suggest that miR-770 inhibits G1-S phase transition through inhibition of the Wnt/β-catenin signaling pathway by targeting CDK8.